Overlays that can be cut as large as 11x11 and small enough for cards. They can even be used as stencils! Tons of individual images, photo mats and more. If you are like many crafters that I have talked to, your main obstacle to getting this collection is that it's "too expensive". All I ask you to do is consider the following. This collection includes three D-size coordinating stamp sets...a $53.85 value. It also includes three coordinating Dimensional Element sheets...a $9.75 value. That makes the cartridge $35.40! Besides, there are 700 images on this cartridge! NOTHING on the market compares in value to this tool. Pre-order the cartridge by July 31 (using the Paypal button below) and I'll pay the shipping and tax (US orders only). You can also add the August Stamp of the Month for only $5 (plus shipping and tax of $2.02). Add $5 and I'll send you an Idea Book. Finally, if you order additional product before August 1st so that your orders collectively reach $150 or more, you'll receive hostess rewards! Your purchase will also qualify you for prize entries during my Open House. 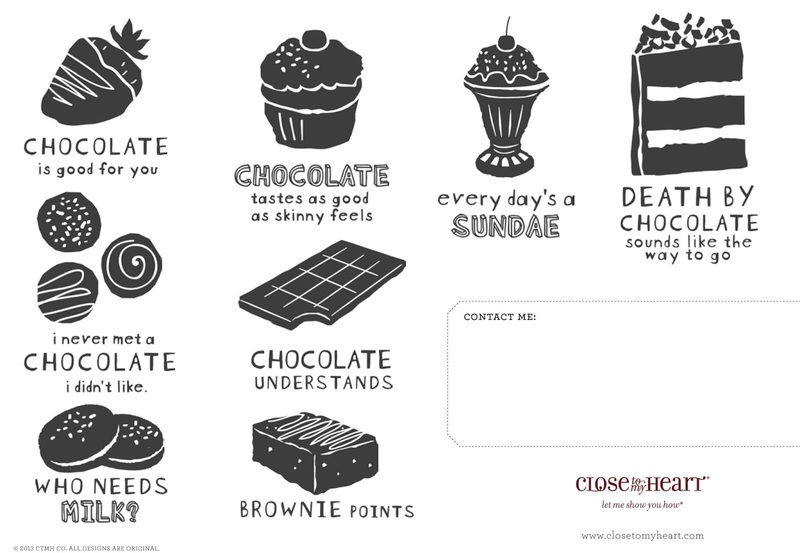 August 2013 Stamp of the Month, "A Chocolate Affair"
Remember, you can use Paypal's Bill Me Later to break payments up or defer payment up to 6 months with no interest. Click here for more information. Host an online or home gathering and with at least $250 in sales you can get it for $49.50! That's half off! (Collection can be ordered on or after August 1.) Contact me to set up your gathering. Hosting a gathering will also qualify you for prize entries during my Open House. Join CTMH for only $49 and you can order it in July AND get 22% off...not to mention 22% off all of your CTMH supplies. Click here to join my team today. Joining my team will also qualify you for prize entries during my Open House. Click here to see the Cricut Artbooking handbook.